Eurasian Chess began with the idea of adding a Queen to Yáng Qí, my westernized Chinese Chess variant. But when I settled on the name of Eurasian Chess, the idea took on a life of its own. I conceived of the game as a synthesis of European and Asian forms of Chess, predominantly FIDE Chess and Chinese Chess. But I also incorporated elements from Grand Chess, another popular variant from Europe, and I bore in mind that Chinese Chess was not the sole Asian variant, and that some others still had closer roots to Chaturanga. So I kept the pieces from Chaturanga that were retained in both FIDE Chess and in such regional Asian variants as Thai, Burmese, and Mongolian Chess. These included the King, Horse, Pawn, and Chariot. I included the Bishop, which was separately created by both the Japanese and the Europeans. I included the main contributions from Europe and China, namely the Queen and the Cannon. And I included a piece of mixed heritage, the Vao, a fairy chess piece created by Englishman T. R. Dawson, which was based on both the Bishop and the Chinese Chess Cannon. Although these are the same pieces as found in Yáng Qí and Chess, I also added some more touches from Chinese Chess. I included the river in the artwork for the game, and I made use of it by limiting the King to its own side of the river. This is a compromise between the full freedom given to the King in Chess and the restriction to nine spaces given to each General in Chinese Chess. I also borrowed the idea from Chinese Chess of not letting Kings face each other across open lines. 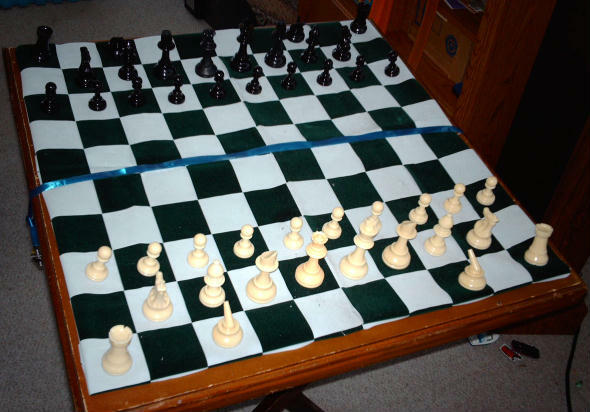 The setup and some of the rules are based on Grand Chess by Dutch game inventor Christian Freeling. I created the original version of the game in February 2003, and I modified the Pawn promotion rules in February 2005 to more closely match those of Grand Chess. This board combines the checkered board common in Europe with a Chinese style board that places pieces on intersections between spaces. The pieces combine the styles and color of pieces used in both Europe and China. They are disk pieces, as are normally used with Chinese Chess, but they have western piece images. The piece images are colored black and white, as European pieces are, but the disks are colored blue and red, as Chinese pieces are. In the ASCII diagram, a row of = signs designates the river. This table shows both Eurasian pieces, as shown in the diagram above, and Chinese character pieces. The usual English names are given under the Eurasian images, and English translations of the Chinese names are given under the Chinese pieces. You may use either set of names. Note that where pieces weren't pulled directly from Chinese Chess, I used my own discretion in choosing which Chinese characters to use. Although I don't actually know Chinese, I made use of Chinese language websites to find appropriate characters. King Like the King in European Chess, Shogi, and some other Asian variants, the King moves one space in any direction, though it may not move into check. Since the King begins on a different rank than the Chariots, there is no castling. As a compromise with Chinese Chess, the Eurasian King may not cross the river. Like their counterparts in Chinese Chess, which may not face each other across an open vertical line, Kings in Eurasian Chess may not face each other across any open vertical or diagonal line. The Chinese character used matches the Japanese character used for the King in Shogi rather than the characters used in Chinese Chess. Queen The Queen was independently invented in both Europe and Asia, but it was only in Europe that it got used in a major regional variant. Japan uses it in Chu Shogi, where it is called a Free King, but not in Shogi, which is the main form of Japanese Chess. In this respect, it is Europe's main contribution to Eurasian Chess. It rides along orthogonal and diagonal lines, just as the Queen from Chess does. The Chinese character used shows a person leaning forward to mouth orders. English speakers may notice that it looks like the letter F, which stands for female. Horse The Horse is an original Chaturanga piece that made its way both east and west. It is common to Chess, where it is known as the Knight, and to Thai, Burmese, and Mongolian Chess. It leaps in an L shape, to any space that is two ranks and one file or one rank and two files away. It may jump over any pieces in its way. The Chinese character used is the same one used for the Horse in Chinese Chess. Chariot The Chariot is an original Chaturanga piece that made its way both east and west. Chess players know it as the Rook, and it is used in all six major regional variants from Asia: Chinese, Korean, Japanese, Thai, Burmese, and Mongolian Chess. It rides along orthogonal lines. The Chinese character used is the same one used in Chinese Chess. Sage The Sage was independently created in both Europe and Asia. Chess players know it as the Bishop. It is also found in Shogi. Sage is the English translation of an old German name for it, der Alte. It rides along diagonal lines. The Chinese character used also means sacred, and it is used in the Chinese names for the Bible, Christmas, and Santa Claus. Cannon The Cannon is Asia's unique contribution to Eurasian Chess. This is the Cannon from Chinese Chess, not to be confused with the one from Korean Chess. It moves as a Rook, except that it must jump over an intervening piece (called a screen) to capture a piece. When it doesn't capture a piece, it merely moves as a Rook. Its Chinese name is Pao. The Chinese character used is also used in Chinese Chess. Arrow The Arrow is a piece whose roots are both European and Asian. It is based on both the Bishop and the Cannon, for it is the diagonal counterpart to the Cannon in the same way that the Bishop is the diagonal counterpart to the Rook. It was probably created by T. R. Dawson in the early 20th century. It moves as a Bishop, except that it must jump over an intervening piece (called a screen) to capture a piece. When it doesn't capture a piece, it merely moves as a Bishop. Dawson called it a Vao, but this seems to be a meaningless name he gave it, not a legitimate Chinese word. I found no system of Chinese transliteration that even included the letter V. Perhaps he considered that bishops take vows, and vow rhymes with Pao. For the sake of designing a Chinese piece, I gave it a Chinese name, transliterated as shi, whose meanings include both arrow and vow. In the 1950's, it was paired with the Cannon in a game called Lion Chess, which replaced the riders in Chess with corresponding hoppers. Pawn The Pawn is an original Chaturanga piece that made its way both east and west. It moves forward one space without capturing, and it captures by moving diagonally forward one space. Like the Pawn in Chess, it may move forward two spaces on its first move, so long as it doesn't capture and isn't blocked. When one Pawn passes another Pawn in an adjacent file on its double move, that Pawn has the option of immediately capturing it by en passant. When a Pawn reaches one of the last three ranks, it may promote to any captured piece of the same color. When there is no captured piece for a Pawn to promote to, it may not advance to the last rank, though it will still be able to check the King on the last rank. The Chinese character shown is one of the Pawn images used in Chinese Chess. The Chinese piece sets in the Zillions file use both images. A King may never cross the river, which lies between ranks five and six. Kings may never face each other across an empty vertical or diagonal line. King + Sage + 2 Arrows, both on the color space the Sage isn't on. 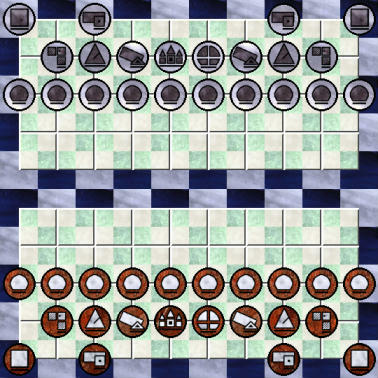 Based on this, the Queen and Chariot are major pieces, the Cannon and Horse are the most valuable minor pieces, and the Sage and Arrow are minor pieces of more limited worth. Taking into account the Queen's greater mobility over the Chariot, and the Cannon's greater mobility over the Horse, the relative worth of the pieces can be ranked from most to least valuable as Queen, Chariot, Cannon, Horse, Sage, Arrow. Bear in mind that the factors making the Sage [Bishop] worth less than the Horse [Knight] do not apply in Chess. It is worth less in this game, because it cannot work as well with the Arrow as the Horse can. When a player no longer has Arrows, the greater mobility of the Sage may make it worth slightly more than a Horse. Likewise, an Arrow is about equal to other minor pieces so long as the player also retains a Horse or Cannon. It drops significantly in value only when a player loses all Horses and Cannons. If you have Zillions of Games installed on your computer, you can play this game. Download file: eurasian.zip. With nothing more than your web browser and an internet connection, you can Play Eurasian Chess online with Game Courier. While I was free to design any kind of board I wanted for the Zillions file, you may want to play this game with more standard equipment. You can play it on a standard checkered 10x10 board, using some extra pieces for the Cannons and Arrows. You might use a Rook and Bishop from another set, or you might use extra pieces in a variant set, such as Omega Chess. If you use a standard board, you can demarcate the river with something or just remember where it is. In the photo shown here, the Queens are from Omega Chess, and the rest of the pieces are from my two Cambaluc Chinese Chess sets. The board is made from interwoven ribbons, and the river is marked by a blue ribbon that's weighted down at each end with a U-bolt. When I first made the Interactive diagram for this variant, I somehow overlooked the rules for King confinement and King facing. I now corrected that, so that the diagram indicates the proper King moves. The non-facing rule was more troublesome, though. In the Xiangqi diagram I had implemented it by a trick, giving the Kings an extra move like a kind of lame 'Ski-Rook', which could not go to the first two squares, but could be blocked there, and relaxing the confinement rule for Kings to allow King capture anywhere. In combination with confinement to the Palace, this would prevent the King could capture anything other than a King with these move. For Eurasian Chess this trick did not work, because the Kings can approach each other more closely than the number of ranks they are confined to. So any move allowing the Kings to capture each other could also be made entirely in the confinement zone, for capturing other pieces than Kings (which can go there). And for distant moves this should of course not be possible. To solve this I made an ad-hoc extension of the Betza notation used by the interactive diagram: the modifier 'k' (which so far was not used) indicates the described move can only be used for capture of Kings (or, in general, royals). This makes it possible to describe the move of the King in Eurasian Chess as KkRkB, and that of Xiangqi as WkR. I believe you're right Fergus, that pieces values are useful fictions (in chess-like games). Yet it's also true that equivalency formulae for tradeoffs of various piece [+ pawns(s), optionally] combinations don't seem to always hold in such games, as a general observation (it also seems to me such formulae are often implicitly based on presumed average piece values). This can depend on whether the position is an endgame, open or closed, and all sorts of other quirky characteristics. In the case of chess such characteristics have been extensively thought about, or have arisen time after time, but for a less explored game like Eurasian Chess I'd suppose there is still a lot to be learned. Still, people (beginners at least) crave having a simple, single set of average case piece values to go by, for any such game. I based my values for Eurasian Chess heavily on the endgame, which admittedly may not be entirely correct, but it's a jumping off point if nothing else. For average middlegame (if not opening) piece values, if it turns out that there's an important distinction that should be made (as by a Chinese Chess book I've seen, regarding some of that game's piece values for the endgame vs. earlier phase), at the moment I have less of a clear idea about what the average values of some of the pieces should be in the earlier part(s) of a Eurasian Chess game, if the values are indeed significantly different than in the endgame. I guess the reasoning is that a Knight plus any other piece is sufficient mating material, but a Bishop must be paired with the right piece to have sufficient mating material. While two Vaos on the same color would be equal in value to a Bishop when paired with a Bishop on the opposite color, this is an unnatural combination that would occur only through promotion, and a single Vao in combination with a Knight or Cannon is sufficient mating material. So, I would not value a Vao at exactly half of a Bishop. I would value it at more than half a Bishop. In the middle game, its value may be close to that of a Bishop, but in the endgame, its value will decrease. In general, piece values are useful fictions, and we should consider values of piece combinations more important than the values of individual pieces. Kevin, I gather that you think the powers of the King in this game somehow reverse the values of the Knight and Bishop, but I'm not yet clear on your reasoning behind this. Glenn, ask your question in a comment for an affected page and give some more detail there.